NASA is slated to launch two cube satellites, along with a small satellite and other experimental payload, onboard SpaceX’s Falcon Heavy for the U.S. Air Force’s Space Test Program-2 mission to improve future spaceraft designs. 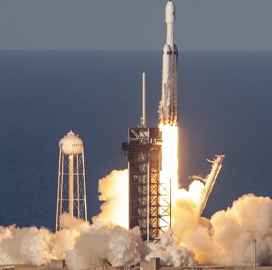 The agency made the announcement on Friday after Falcon Heavy completed its first operational flight from NASA’s Kennedy Space Center in Cape Canaveral, Fla.
“We have important technologies that are ready to fly, and this success helps put us on that path,” said Jim Reuter, acting associate administrator for NASA’s Space Technology Mission Directorate. Falcon Heavy will carry the Enhanced Tandem Beacon Experiment, which will use twin cubesats to assess how large atmospheric bubbles over the Earth’s surface distort radio and GPS signals. The launch vehicle will also support the Green Propellant Infusion Mission, which seeks to discover alternatives to existing chemical propulsion systems and avoid reliance on hydrazine rocket fuel propellants. The multi-manifest mission's third experiment, called the Deep Space Atomic Clock, will deploy the world’s first ion clock designed to help spacecraft autonomously navigate in deep space. The Air Force and SpaceX will conduct preparations for the STP-2 launch from the Kennedy Space Center over the next months.